Viktor Orbán, Hungary’s prime minister, says the “overwhelming majority” of migrants in Europe are not refugees but are merely seeking a better life. Robert Fico, his Slovak counterpart, says up to 95% are economic migrants. David Cameron, the British PM, is more decorous in his language, but always speaks of Britain’s duties to “genuine” asylum-seekers, with the implication that plenty of migrants do not match that description. But many officials, such as António Guterres, the UN High Commissioner for Refugees, say that Europe’s crisis is primarily about refugees. The distinction matters, for under the 1951 Refugee Convention and a string of EU laws, European countries must offer refuge or other types of protection to asylum-seekers who can demonstrate that they are fleeing war or persecution. They are under no such obligation to those looking to improve their prospects, even if they have left behind lives of destitution. So if Messrs Orbán and Fico are right, Europe’s migration crisis amounts largely to a problem of border management and repatriation; not relocation, integration and the rest of it. Are they? Let’s look at the numbers. According to the EU’s most recent Eurostat report, which covers the first quarter of 2015, there are seven countries whose nationals obtained a “rate of recognition” (meaning some form of protection in an EU country) over 50%: Syria (94%), Eritrea (90%), Iraq (88%), Afghanistan (66%), Iran (65%), Somalia (60%) and Sudan (53%). Put crudely, citizens of these seven countries obtained protection in the EU over half the time they applied. How many of these people are reaching Europe? 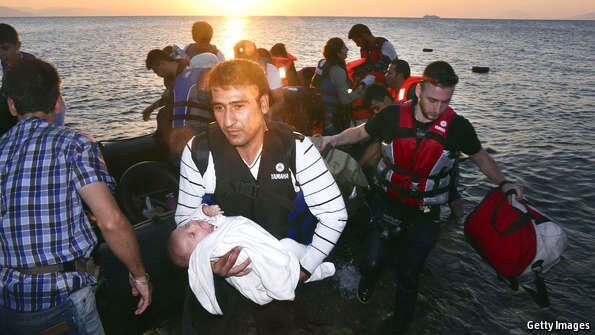 The UNHCR says that Syria, Afghanistan and Iraq account for 92% of the 244,855 migrants detected arriving in Greece this year. Citizens of Eritrea, Somalia and Sudan comprise 41% of the 119,500 arrivals in Italy, and another 6% come from Syria. (This year has seen a geographically logical sorting of migrants: most from the Middle East and Asia now reach Europe via Greece; most from Africa sail from Libya to Italy.) The UNHCR site doesn’t list numbers for Iranians. From here we can extract our first tentative conclusion: citizens from countries that usually obtain protection in the EU account for 75% of illicit arrivals by sea this year. (Iranians would nudge that number a little higher.) What about the migrants who have caused such grief for Mr Orbán as they make their way through his country en route to Germany and elsewhere? Crunch the numbers further and we find that at least 81% of those migrants entering Greece can expect to receive refugee status or some other form of protection in the EU. (The actual number will be higher, for citizens from some countries unlisted in the UNHCR figures will also obtain protection.) The figure for those entering Italy, who are a far more diverse bunch, is 46%. Many Nigerians, Bangladeshis and Gambians, among others, fail to obtain protection after crossing the Mediterranean. Let’s look at the numbers another way. Under the European Commission’s new proposal to relocate 160,000 asylum-seekers from Italy, Greece and Hungary to most other EU countries, only nationals from countries with acceptance rates over 75% will be eligible. For now that means Syrians, Eritreans and Iraqis. This matters because it is only these people, once they are relocated, that will trouble the likes of Mr Fico (although not Mr Cameron; Britain will exercise the opt-out it enjoys from such matters). According to the UNHCR’s figures, these three groups account for 62% of total arrivals by sea this year. We might also note that 227,169 Syrians, Eritreans and Iraqis have already been detected at the EU’s borders so far this year. The commission’s proposal aims to cover the next two years. Even if it is enacted, the plan will cover well under half of the total number of eligible nationals who reach Europe in that period. On top of this, the Eurostat numbers cover only “first-instance” decisions. Plenty of applicants receive protection on appeal. We should also note the large variation between EU countries: Germany, for example, accepts 68% of Afghan asylum-seekers while Hungary rejects three-quarters of them. These, and other administrative wrinkles, complicate the findings. Still, the headline numbers suggest that the vast majority of illegal migrants reaching Europe will be eligible for protection once they arrive. So what are Messrs Orbán, Fico and Cameron on about? One possibility is that they are simply looking for excuses not to relieve the burden on other European countries. But there are more generous explanations. One is that the long, often-dangerous European journeys attempted by most migrants after they reach Greece or Italy suggest that they have more on their minds than simply finding a place of shelter (although, as noted, the generosity of EU members’ asylum policies vary widely). Another is that there are signs that many Syrians are leaving Turkey after several years of refuge, perhaps because they have lost hope of returning home. That is not ignoble, but it hints at motives that go beyond the immediate need for protection. Most experts who have worked with asylum-seekers point to a mixture of motives. War may be the catalyst for a journey that refugees will then seek to make as economically beneficial as possible (and one that more can afford than in the past). And motives may change over the course of a migration, particularly for sub-Saharan Africans who must make long and extremely perilous journeys across the Sahel and Libya before reaching Europe. You may not have been fleeing persecution in, say, Senegal, but once you reach Tripoli there really is no turning back. The motivations of migrants, it turns out, are often no different from anyone else’s: complex, dynamic, inconsistent. That maps awkwardly on to the neat legal distinction between refugees and economic migrants that Europeans are obliged to follow when assessing asylum-seekers’ claims. But it provides a grounding for the exclusionary logic of Mr Orbán and friends. To argue thus is their prerogative. But others will hope that in dealing with large numbers of migrants who, the data show, have fled countries stricken by war or the caprice of dictatorship, European politicians would strive for a more generous approach. Charlemagne columnist, the Economist. Formerly of Los Angeles and London. There's no set time I have my tea at.